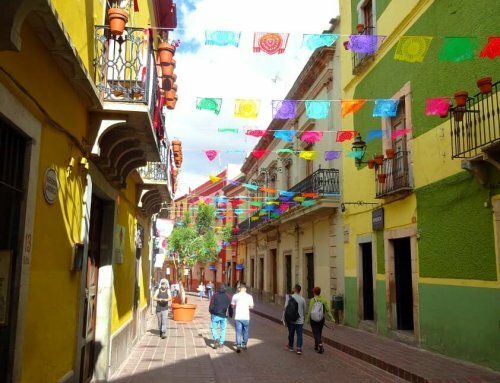 Mexico is a fascinating country full of ancient cultures, mysteries and spectacular natural wonders. And if you’re interested in learning about ancient cultures and civilizations, then the archaeological sites in Mexico will blow your mind. The country has over 150 archaeological sites and thousands more waiting to be excavated. So no matter where you are in Mexico chances are you’re only a bus ride away from an ancient Mexican ruin. Make sure you visit some! 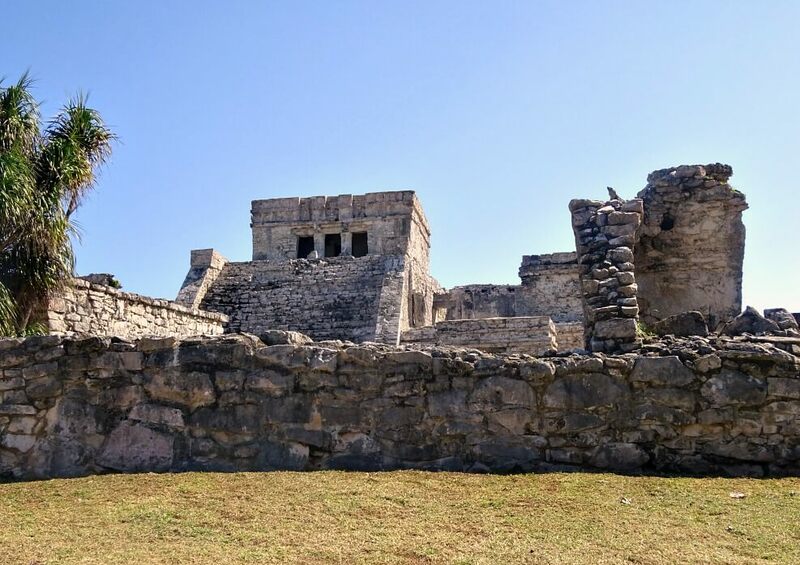 Here are three ancient Mexican ruins to help you decide where to go in Mexico. They’re all different from each other, think jungle ruins, beach ruins and even a New Wonder of the World. To add to the mix you might like to check out our post on Teotihuacan near Mexico City. 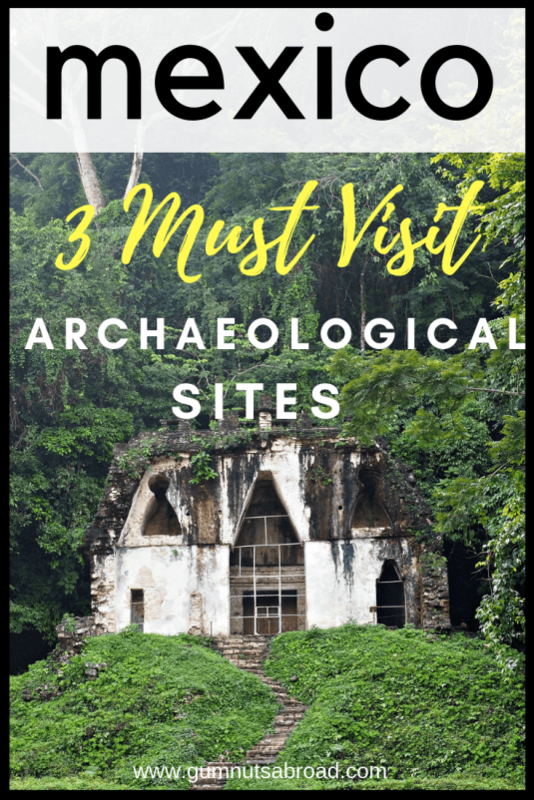 3 Archaeological Sites in Mexico That’ll Blow Your Mind! It was so humid my eyelids were sweating. And the sunscreen I’d applied that morning was making my eyes sting. Rubbing them didn’t seem to help. Plopping down as I reached the top of the temple, I could feel the heat from the ancient stones on the back of my legs. I pulled a bottle of water from my bag, took a swig, passed it to Andrew and took in my surroundings. Everywhere I looked was green. A green so deep and rich I wanted to dive into its cool lusciousness. We were sitting atop one of the temple ruins of Palenque – the jungle ruins. I was hoping to spot (and hear) a howler monkey. 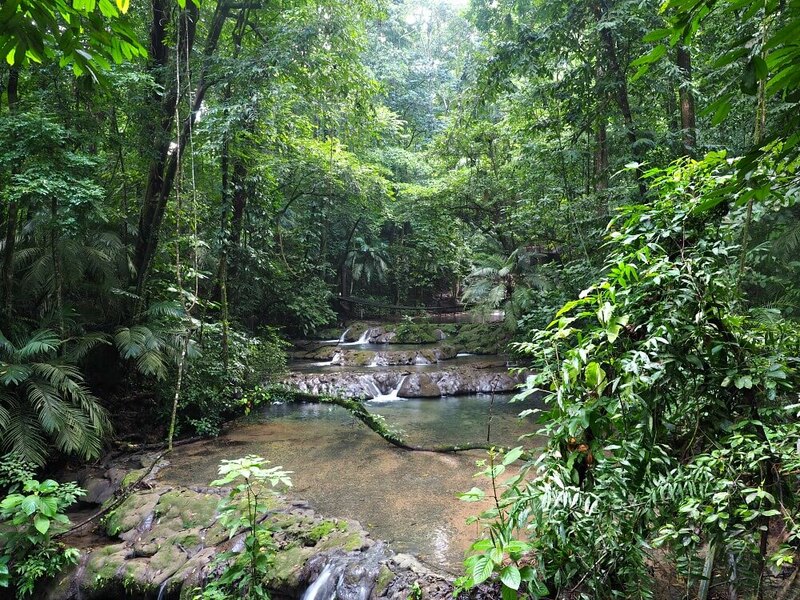 All the guidebooks said there were howler monkeys, toucans, and ocelots living in the surrounding jungle. It certainly looked like it could sustain an abundance of wildlife. But all we saw were a couple of cute lizards. 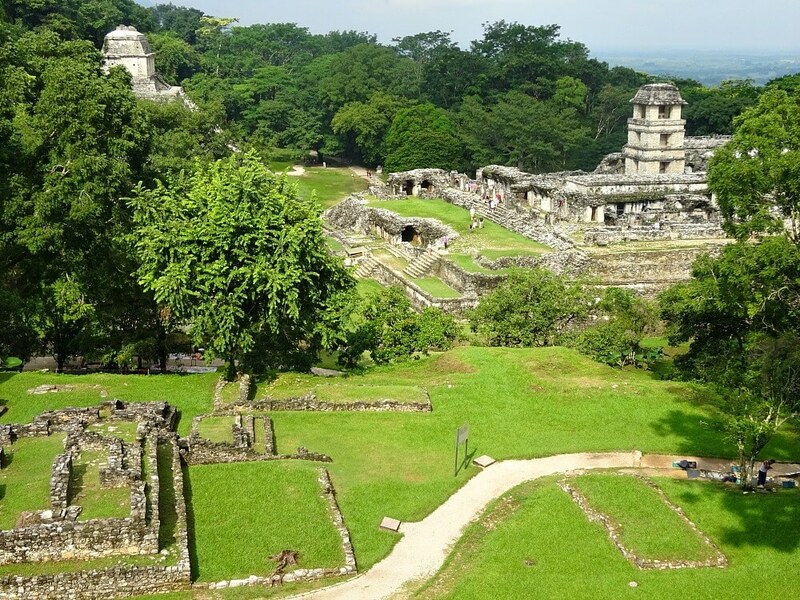 Palenque was once an important Mayan political centre that peaked between 226 and 799 AD. It was abandoned around 900 and was hidden from civilisation by jungle growth until it was discovered in the 18th century. 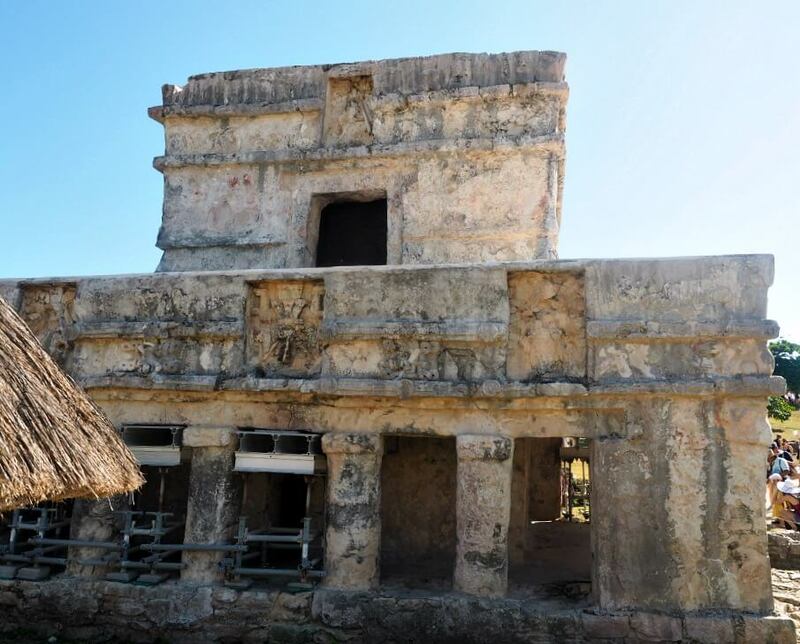 It’s now one of the most enchanting archaeological sites in Mexico. The Temple of Inscriptions was built as the funerary monument for the ruler of Palenque in the seventh century. It sits on top of an eight-stepped pyramid and consists of two passageways divided by several pillars. It’s thought that both the temple and pyramid were painted red which was common for Mayan buildings at that time. 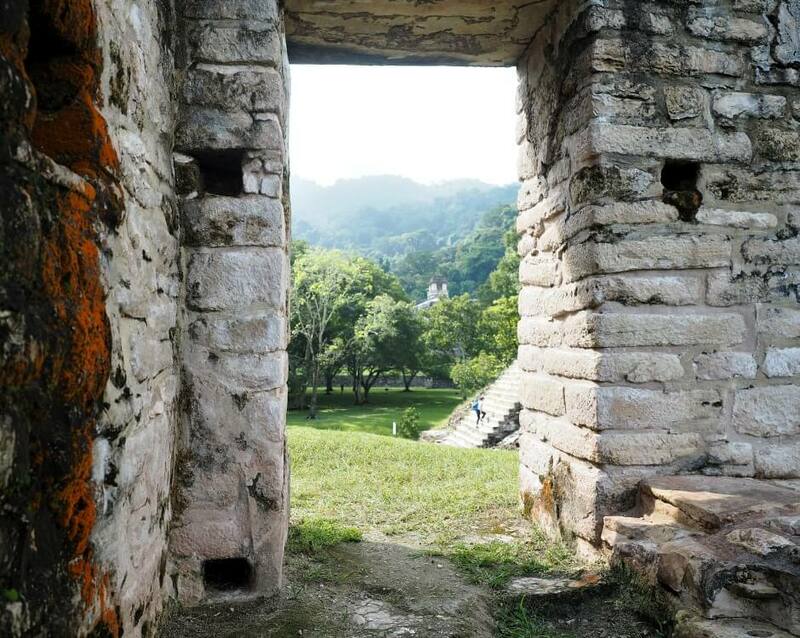 Despite the heat and humidity, part of Palenque’s appeal is climbing over the ancient monuments and discovering it for yourself. Incredibly only ten per cent of the city has been excavated and you can see archaeologists at work as you wander around. Look out ancient building the jungle is coming for you! Once we’d finished our explorations we wandered along some jungle paths that lead to the exit. There’s a creek with a swing bridge, pretty waterfalls and more overgrown ruins to explore. But be careful around here the steps and paths are slick with moss. Andrew took a nasty tumble on some slippery stairs landing on his back. He was alright but I wouldn’t recommend this section to anyone with mobility problems. 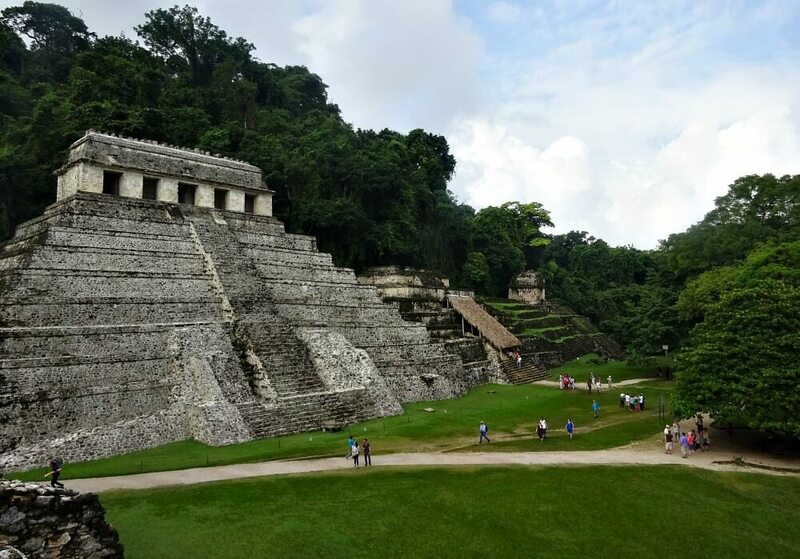 When you’ve finished exploring Palenque, it’s worth stopping by the museum on the main road. Inside you’ll find a tomb belonging to one of Palenque’s rulers. It wasn’t discovered until the 1950’s and was so well hidden it hadn’t been raided or pilfered. The items they found are well preserved and beautifully displayed. Where to stay in Palenque. When visiting Palenque you have two options for accommodation. 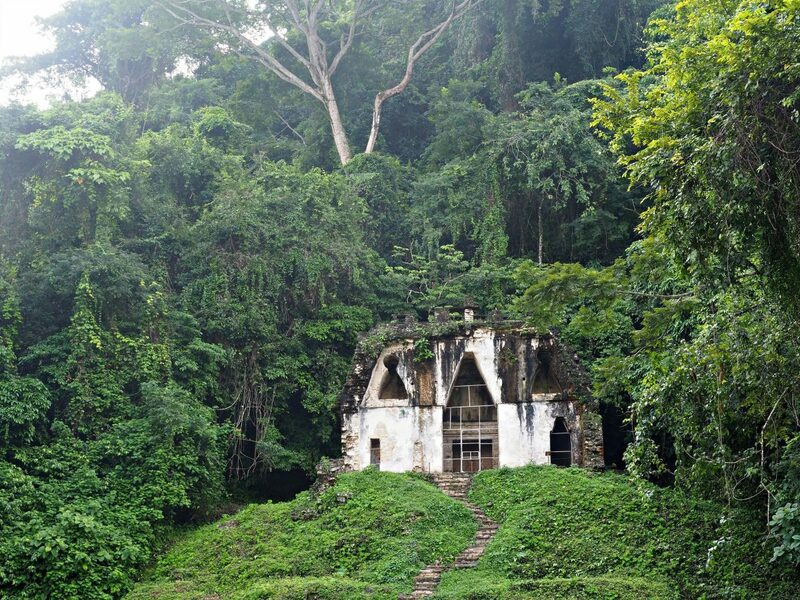 You can either stay in Palenque town, a 15-minute ride from the ruins, or you can stay in the jungle town El Panchan right outside the site. We chose to stay in town as we’ve been caught in the middle of nowhere before, with no transport, or Wifi and limited options for eating. However, we’ve heard good reports about El Panchan and it’s convenient if you want an early start. Palenque town is much nicer than described by our guidebook and we enjoyed our two nights there. To get to the ruins we simply caught one of the many colectivos (small buses) that shuttle back and forth. Both areas have their advantages and it’s up to you what suits your needs best. Click here for more information and the latest rates for the best place to stay in Palenque. We hadn’t planned to visit Chichen Itza. Well, at least not the day we did. We’d caught a bus from Merida thinking it would stop in the nearby town. But instead, it dropped us off at the site itself. There was a constant stream of cars and buses to and from the site. Traffic moved at a snail’s pace and was banked up for kilometres along the road. 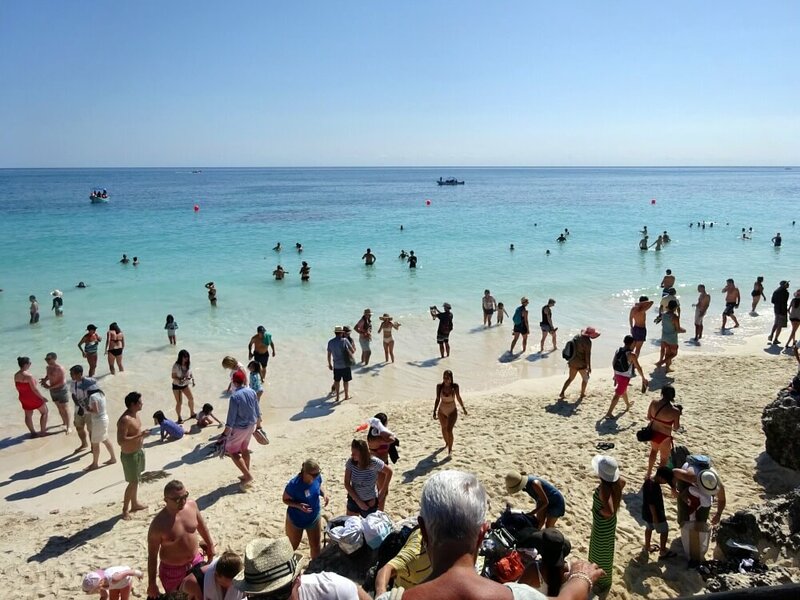 It seemed like the whole of Mexico wanted to see one of the New 7 Wonders of the World. So there we were, standing amongst the chaos surrounded by our luggage. Not really sure where we were or what to do, and feeling a little foolish. Looking around the carpark for inspiration we spotted two girls with backpacks. They looked as bewildered as we did. So we wandered over to talk to them, and it turned out they weren’t quite as bewildered as we thought. Apparently, there was a regular bus we could catch into town. And there was a visitor centre inside with lockers where we could stash our packs. The visitor centre was a well-organised hub of activity. With lockers, cafes, gift shops and even a travel desk where people could buy bus tickets. After hiring a couple of lockers and eating an early lunch, we headed out to the site. Chichen Itza is wildly popular and it was easily the most crowded tourist attraction we visited in Mexico. Which is most likely one of the reasons it was voted one of the New Seven Wonders of the World. Chichen Itza is also a UNESCO World Heritage Site. Temple of Kukulcan is the famous pyramid that dominates the site. And at 98 feet high it’s impossible to miss. The temple has 365 steps, one for each day of the year, and inside is a smaller pyramid with a statue of the god Chac Mool. Next to the pyramid is the Temple of the Descending God which was associated with two important aspects of Mayan culture – bees and war. Yes, that’s right, bees. You can read about it here. Fun fact: When you clap your hands at the base of the pyramid it echoes with a weird chirping noise that sounds like the call of the sacred quetzal bird. Built over an older monument dedicated to the Reclining God, Chaac Mool, the Temple of the Warriors is surrounded by hundreds of columns. It sits adjascent to the Temple of the Jaguar which is the only monument that bears the name of the Descending God. 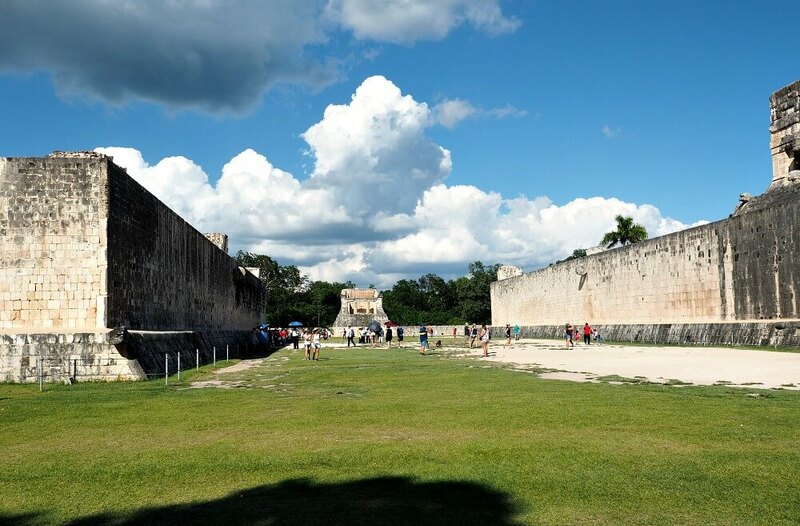 The Ball Court is the largest and best preserved in the Americas. Not only were the games used to entertain the crowds but also for religious rituals – losers of the game were often sacrificed to the gods. The competition must have been intense! After visiting all the monuments in Chichen Itza we wandered along some leafy trails to the Cenote Sagrade. There were less people here amongst the shady trees. We even spotted a big lizard basking in the sun! After the cenote, we headed back to the visitor centre, where we enjoyed a deliciously sweet and sticky ice-cream. Sugar is a girl’s best friend. You have to be adaptable when you travel independently. This is especially true if you don’t like to pre-book accommodation because sometimes things don’t quite go to plan. 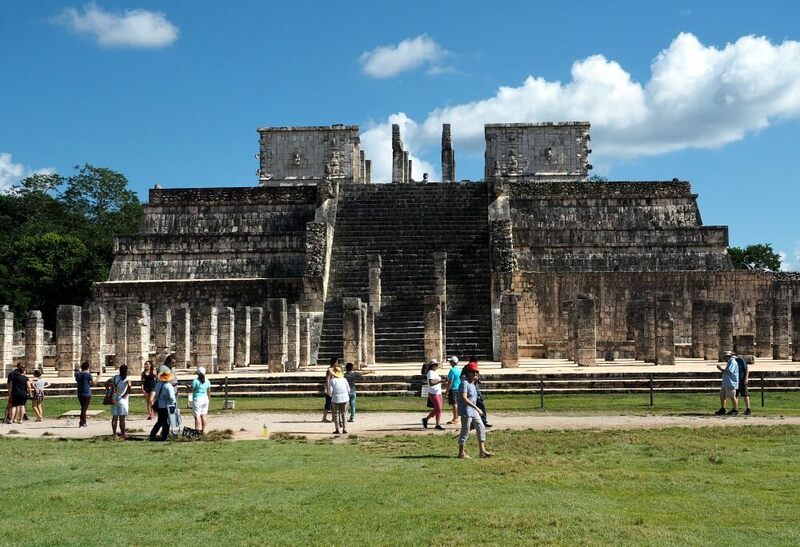 As was the case when we arrived in Piste the closest town to Chichen Itza. 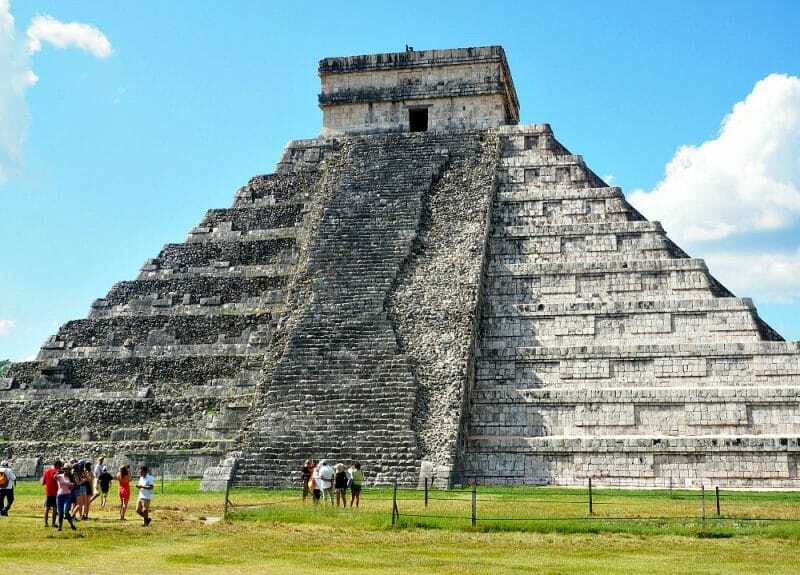 We hadn’t factored in that Chichen Itza is one of the New 7 Wonders of the World and every tour company in Mexico goes there – and the visitors stay in the nearby town. So it was tough finding a room even when we looked at hotels outside our price range. After some legwork, we managed to find a room in a semi-abandoned hotel that could easily feature in a horror movie. We’re budget travellers and are used to less than ideal accommodation but this place gave me shivers. If staying overnight make sure you book ahead! By dinner time we (me) couldn’t be bothered going out to eat so we stayed in and ate chocolate and chips. Together with the ice-cream, it was a pretty good day. Of course, the ruins weren’t bad either! 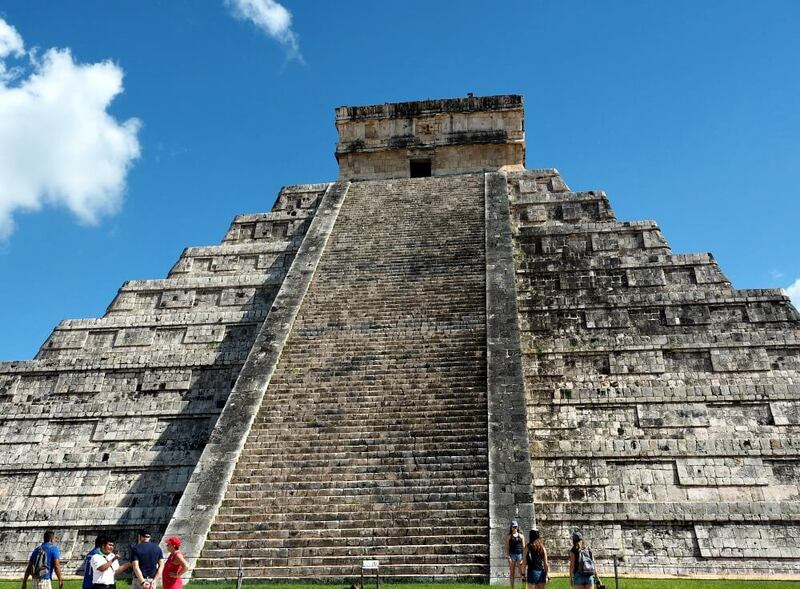 Click here for the latest rates and availability of the best places to stay in Chichen Itza. When it comes to real estate the three words everybody uses are: location, location, location. And when you see the ruins at Tulum you could be forgiven for thinking they invented the phrase. The ancient city is perched on a dramatic cliff overlooking the Carribean Sea with million dollar views. It’s hard to imagine a more beautiful place to live. Tulum was built to be a fortress and with its cliff-top setting, it presented an imposing image to anyone approaching by sea. Surrounded by walls on three sides, it was an important trading post in the 13th and 14th centuries. We walked from the town of Tulum to the ruins via the beach. It’s a long walk and most people ride a bike or take a colectivo or taxi. Getting to the ruins from the beach is a little tricky – it was a fortress after all. We had to scramble over rocks to get up the cliff and then walk along a barely-there track to the ruins. It’s best just to follow the road. 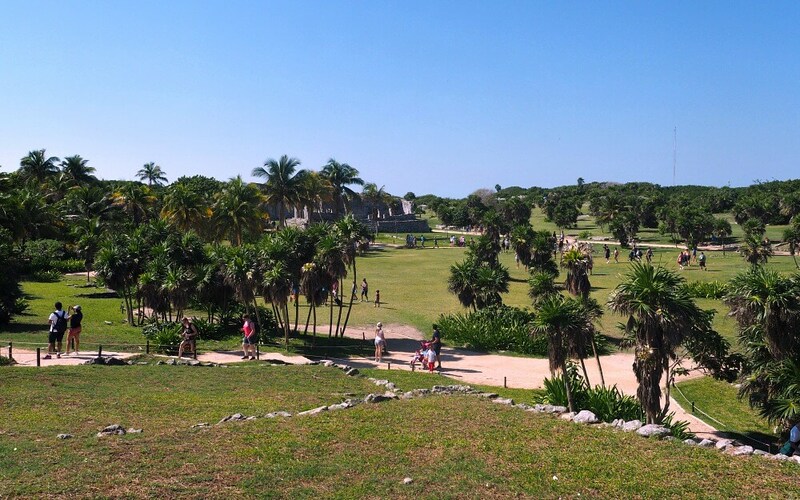 At 7.5 metres tall El Castillo is the largest building in Tulum. Sitting prominently on the cliff top, it was most likely used as a landmark for sailors. The blue sky, turquoise water, and luscious greenery make a stunning backdrop for the rugged stones of the Temple of the Wind God. 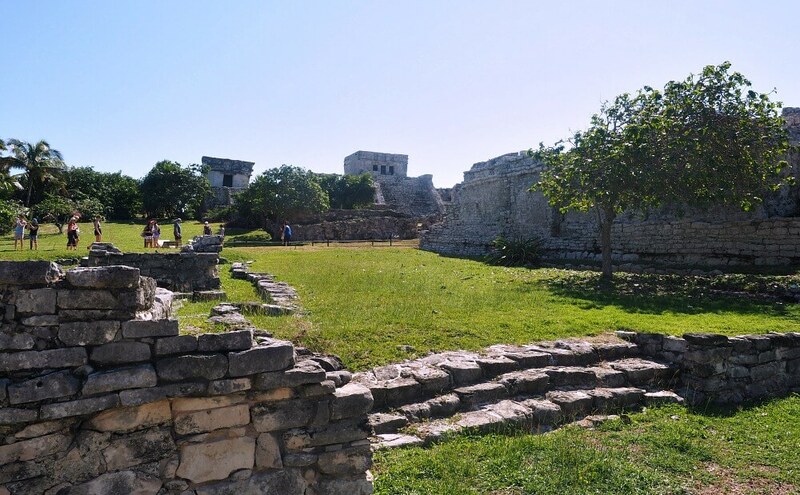 The Palace was three stories high and was the largest residential building in Tulum. 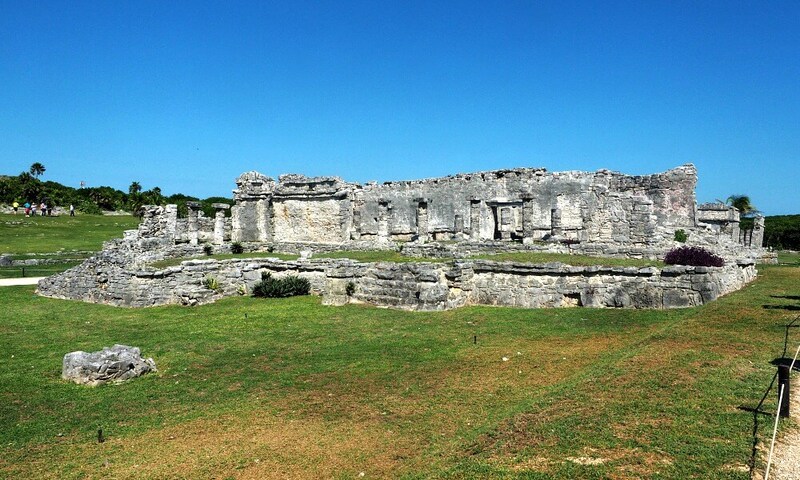 It was most likely home to members of the upper class of Tulum society. The building is decorated with carvings and images honouring the gods. The first thing I noticed about the Temple of the Frescoes was the different coloured stones. They are much lighter than the other buildings’ dull grey. It’s thought to have been a place of deep religious significance. 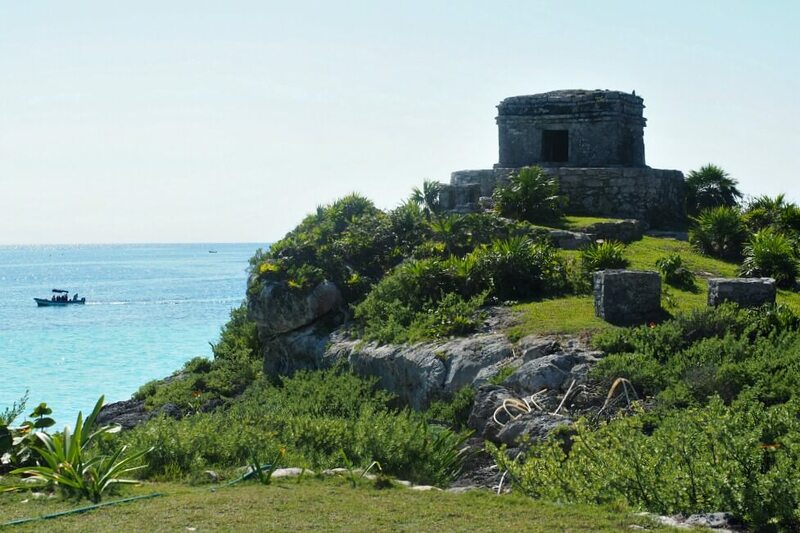 When I think of the Tulum ruins, the two words that come to mind are “pretty” and “charming”. The city only had a population of 1,600 so Tulum is a small archaeological site and it doesn’t take long to get around. It’s well laid out with sectioned off paths for visitors to follow – climbing over the ruins is not allowed. The most popular attraction at the ruins isn’t a ruin at all. It’s the beach! Despite the fact, there’s a long stretch of beach right next to the site everybody wants to swim in the little cove at the bottom of the ruins! We stayed at the Weary Traveler Hostel in Tulum. We had our own room with a private bathroom and a good sized breakfast was included. There’s a chef who cooks eggs for you, while you make your own pancakes, toast, coffee, and cereal. As much as you can eat. Other added extras include free yoga, meditation and salsa classes, live music and free drinks at happy hour. There’s a pool and we were able to get Wifi in our room. There’s a real community feel to the place with everyone eating (and drinking) at long communal tables. For information including rates and availability for Weary Traveler Hostel click here. Looking for something a bit more up-market? Then click here for more places to stay in Tulum. So that’s it. 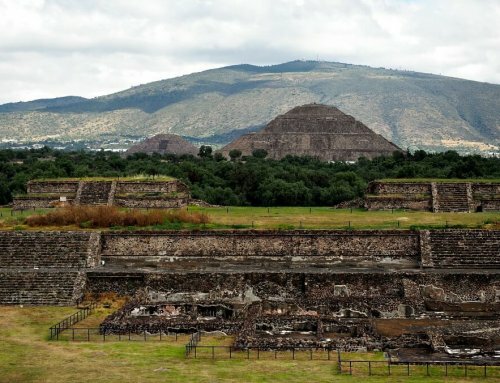 Three archaeological sites in Mexico that will blow your mind. Which ones are you planning to visit? What would you add? 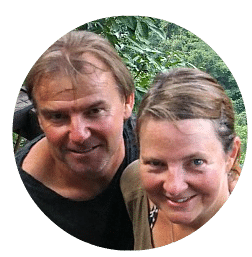 If you’re spending some time in Mexico and Central America you can learn more about our time in the area by clicking here.